As an art director, you’re in charge of the imagery and layout of an ad all together. You need to make sure that the message you want the audience to receive is portrayed correctly. A well-known fact related to advertising is the “6 second impact”, where you only have 6 seconds of attention from the audience while they’re going through their day. This relates especially to outdoor advertising. If a person is walking down a street and walks by a bus shelter with an ad on it, you only have 6 seconds of their attention. Therefore, you shouldn’t have lots of copy on it that the audience won’t have time to read in such a short amount of time. That’s where the saying “6 words, 6 seconds” comes from, or even better: no words at all. The phrase “a picture is worth 1,000 words” is developed from an even older saying which is “one look is worth a thousand words.” It appeared in a 1913 newspaper advertisement for the Piqua Auto Supply House of Piqua, Ohio, but ironically uses only words, not images, to invite prospective customers to see its products in their store. The point of it being how instead of explaining all its features and printing photos of every angle, one look at it with your own eyes will say it all. I think both phrases are nice references to how we only have the audience’s attention for a short amount of time, and how that time can be well spent with viewing instead of reading. Take these great Lego ads for example. All it needs is an image with a strong impact and the product’s logo. Never underestimate your audience’s ability to figuring things out on their own. They don’t need a few sentences explaining the joke. They could have had a clever tagline under the imagery saying something about how great children’s imagination is, but they chose not to, and it made the ad so much better. Without any words to read, you reach out to so many more people as we all have got the time to simply look at the image. It also helps that the logo is well recognizable. The ad also possesses bright, playful colors to catch their attention even more. The art director or creative person behind these posters is a genius in my eyes, I wish I had come up with this idea myself. 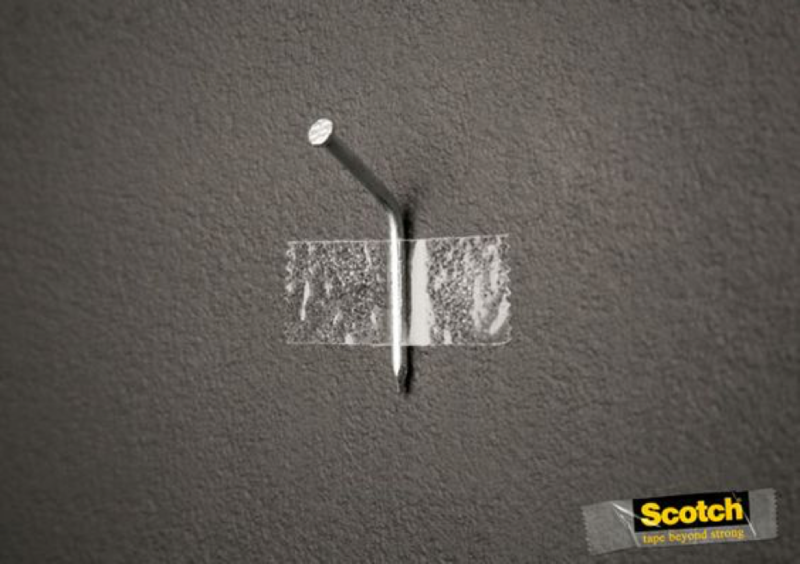 This ad for Scotch tape is another image dominant ad that I find very clever. It is so self-explanatory and it also consists of only an image and the logo for the product. There is also Scotch’s slogan underneath their logo which they don’t even needed to ad for us to understand their message.